Located in the heart of the most important ancient world civilization, the Minoan and birthplace of the leader of the Olympian gods, famous for its hospitality, Xenios Zeus, is the the RETHYMNO MARE HOTEL beachfront hotel located in the picturesque tourist area of 20,000 square meters in Skaleta. 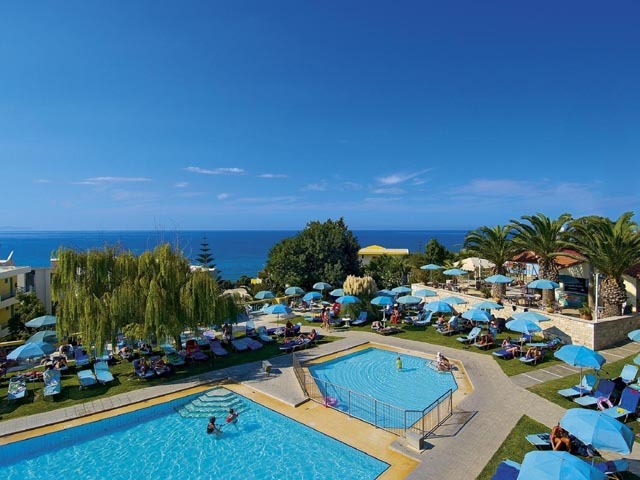 Hotel Rethymno Mare & Water Park Hotel consists of 132 Superior Rooms, Deluxe rooms with Jacuzzi, Family Suites (some with Jacuzzi) &, Family Sharing Pool Suites, all with excellent views of the Cretan Sea, the White Mountains, the beautiful gardens and the pools of the hotel. The majority of the Family Suites have corner bath-tab with Hydro massage at the bathrooms as all Deluxe rooms. The main restaurant has views of the crystal blue waters of the Cretan Sea. It offers life cooking, rich buffets with a large selection of delicious Greek, Cretan and International dishes. Aphrodite Cocktail Bar is open from the afternoon till late at night. Sit and enjoy a refreshing drink whilst admiring the crystal clear waters of the Cretan Sea & the city of Rethymno. Located by the pool, Pool Bar Jasmine offers refreshing drinks and cocktails, beverages,tasty light meals and snacks.